This Sunday Sho-chan and I went to the Hanshin Racetrack at Niigawa to watch the horse races with some of his friends from work. I'd never been to a horse race before, (although I did go to the boat races with Non-chan and Tencho a few years back), so I was interested to see what it was like. We went to the boat race as guests of a former boat racer, so we got to sit in the VIP area which was really nice and had free drinks, but the rest of the race course was dirty and filled with very creepy looking, obviously gambling-addicted, smelly old men. I was afraid that the horse races would be the same, but Sho-chan assured me that they were much cleaner and nicer than the boat races. 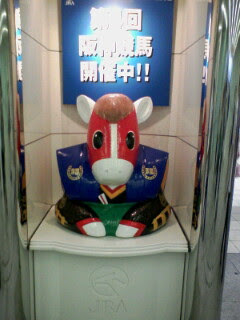 He was right, although there were some creepy oyajis around, it was mostly clean and nice and even had a nice gift shop where you could get handtowels and keychains and what-not with the track mascot 'Turfy' the racehorse (pictured above) on them. We had quite a fun time and I bet on a few of the races, mostly picking the horses by their names, the jockey's name or the fact that they had the same birthday (the horse) as someone I knew. I spent about ¥2,000 ($20) all told, and I actually picked two winners. 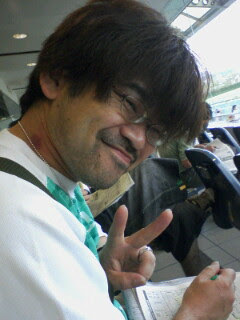 Sho-chan and I kept our bets to ¥100 or ¥200 a go, but some of his co-workers put ¥10,000 on a single horse! I was shocked, but I guess whatever butters your toast is alright.